Choose this website theme to make a professional website for your commercial or private projects. If you deliver exclusive distant learning, online education classes or online education services, then this responsive education articles website template will be a splendid solution suitable for you. With a totally responsive layout, the template performs great on any device whether it's a desktop or a smartphone. This website design flawlessly delivers the corporate feel and style of a serious, reliable organization which doesn't forget to trace all modern technology to stay relevant. The design was built with valid, semantic code and the most up-to-date web design trends in mind. Regarding any trouble with this template, you can communicate with one of the professional assistance managers and they will solve the issue of any nature for customers. Choose this website layout to show customers how easy it will be to deal with you. This is really well integrated, easy to use package, generic enough. The CSS is well formatted and organised so it is easy to customize the color and the look. Very useful template that gives me the ability to use it for many purposes. It is clean and simple but in the same time user friendly which is key for UX. I would suggest this template to anybody who is looking for practicality and simplicity. It is perfect for organizations that have well structured methodology of work but are not too hierarchical. 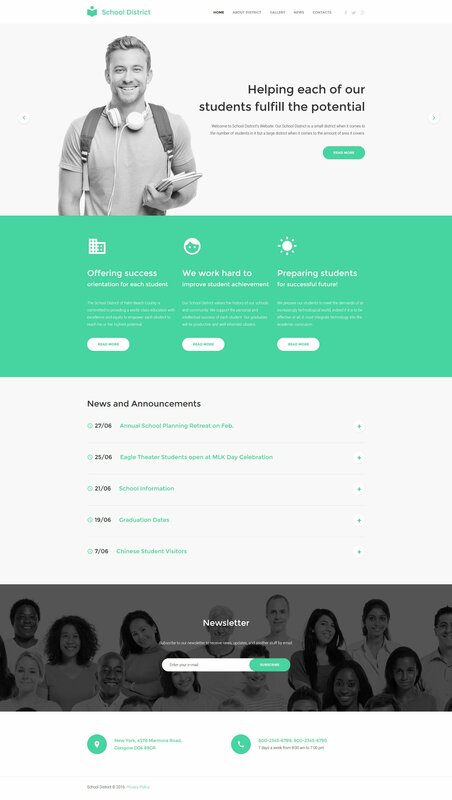 This responsive website template is well suggested for education but it can be used basically for anything. Very good coding. It was easy to install and get it running. Like its responsiveness. Thanks for such a nice theme.